Tribal people in our 4 new villages in the Coimbatore district of Tamil Nadu are undertaking new means to earn a living. They are learning things from jewellery-making to bakery skills to computer literacy. The three-year project is teaching a model for skill development, capacity building and food processing to find new ways to generate income. Dr. Jhanci Rani. P.R. with Amrita University is leading the training. She is well known for her work with the Food Nutrition and Health Education Department. Working with her is Junior Research Fellow, Krithika. Both are from the nearby area of the villages. At this time, the classes running are three 4-day sessions on jewellery and craft making. Women and adolescent girls have responded well with about 50 taking part. 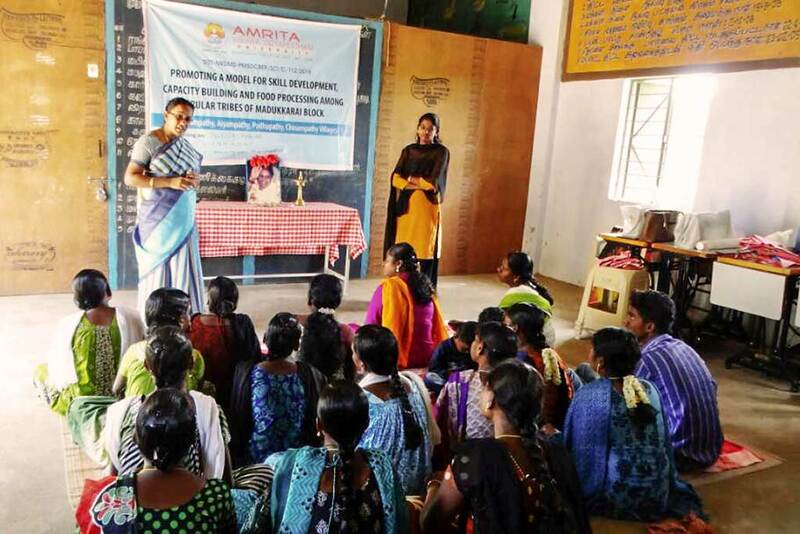 The results of their efforts will be sold in local shops and beauty parlours as well as at the nearby Coimbatore Campus of Amrita University. Various training programmes to come include vegetable & fruit processing, millet-based baking, management of seed banks, service & electrical training for boys & girls, computer-based skills, and how to access available government schemes. The Irula people taking part are from the villages of Muruganapathy, Ayanpathy, Pudhupathy and Chinnapathy.